China has offered to go on a six-year buying spree to ramp up imports from the US in a move that would reconfigure the relationship between the world’s two largest economies, according to officials familiar with the negotiations. By increasing goods imports from the US by a combined value of more than $1trl over that period, China would seek to reduce its trade surplus -- which last year stood at $323bn -- to zero by 2024, one of the people said. The officials asked not to be named as the discussions aren’t public. The offer, made during talks in Beijing earlier this month, was met with skepticism by US negotiators who nonetheless asked the Chinese to do even better, demanding that the imbalance be cleared in the next two years, the people said. Economists who’ve studied the trade relationship argue it would be hard to eliminate the gap, which they say is sustained in large part by US demand for Chinese products. U.S. stocks extended gains and the dollar rose following the news. The S&P 500 Index rallied, climbing 1.3% by 1:27 pm and heading for its fourth weekly advance, while the dollar traded at session highs. “If China switches its imports from other countries to the US -- less Brazilian soybeans, more US soybeans -- that might help deal with their bilateral problem with the US, but at the expense of worsening imbalances with other countries,” he said. It’s not clear how quickly US farmers and companies would be able to meet increased Chinese demand, he said. Increasing exports of soybeans would require more land dedicated to growing the crop and investment in storage capacity. Likewise, exporting more LNG to China would demand a surge in investment in export terminals. For Boeing, which has been straining to meet existing orders for its planes, it would likely mean adding a new plant. Moreover, none of that would address US demand for Chinese-produced goods and China’s control of the assembly of products such as smartphones and laptops, or some of the main drivers of the US trade deficit. Shifting production or final assembly to a place such as Vietnam would do a lot to reduce the US deficit with China but it would potentially be illusory. 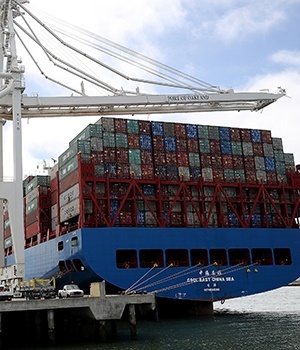 Closing the trade gap “would require enormous changes and it would require and all out effort to get a Chinese industrial policy to disguise China’s exports to the U.S. by routing them elsewhere,” said Setser, who is now at the Council on Foreign Relations. The US will miss an opportunity for discussions with its trading partners after President Donald Trump canceled his trip and the US delegation’s visit to the World Economic Forum in Davos next week amid the partial government shutdown. While no plans were disclosed for negotiations, Chinese Vice President Wang Qishan is due to attend the Davos summit. There’s no clear sign that such an offer would now have a greater chance of success or even if it’s practically feasible. US negotiators are also focused on matters including China’s alleged intellectual-property malpractices and state support of industry, disputes that are much harder to bridge. The Americans’ major sticking points were more prominent issues than China’s import plans during the latest round of talks in Beijing, one of the people said.